Quickly locate collaborators at your university. Find faculty based on any data that is visible on their web profile. Be it an administrative title, a keyword in a publication or grant, or just a first name, our search enables collaborators to find each other. It also does a great job of finding a faculty member’s assistant’s email too! 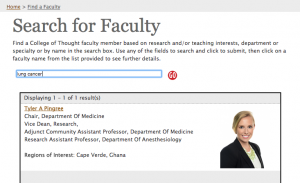 Faculty Finder Sample. Click for Larger View.